October 15th marks the beginning of the most auspicious month of Damodara. Many devotees will observe fasting from urad dahl, and others will perform austerities by chanting extra rounds, eating more frugally, and increasing the level of their devotional activity as much as possible. During the period of Damodara, devotees will offer lighted ghee lamps and chant the Damodarastakam to Lord Damodara, both morning and evening, to obtain His special mercy. To glorify the Lord congregationally at the temple, in the association of the Vaisnavas, is most purifying. Many devotees go on pilgrimage to Vrindavan during Damodhara to perform their vrata in the Holy Dhama. For those unable to go to Vrindavan, Srila Prabhupada’s temples are non-different. Join us in our temple on 19th October 2008 as we celebrate this joyous festival. Let us all bind the Lord with our ropes of love. For more info, please call HG Kalidas or HG Ram Gopinath at Iskcon Klang, at 012-6342464 / 012-3179206. The centre is located at 20 Lorong Besi 4, Off Jln Teluk Pulai, 41100 Klang. all glories to SRI RADHA DAMODAR. By bathing in sacred places and giving charity during the month of karttika, a person in any country attains piety equal to an agnihotra-yajna. Kartik is the holiest month in the Hindu lunar calendar. It usually overlaps with the months October & November in the English calendar. Kartik Maas, also known as Damodar Maas, is described in the scriptures as the best among months for performing austerities. Kartik or the festival of offering lamps to Lord Krishna, glorifies Lord Krishna’s pastime of being bound with ropes by Mother Yashoda. Observing vrata in the month of Kartik is glorified in the Puranas. * Japa – chanting the holy names of the Lord. * Worship the Lord by offering ghee lamps (diyas), flowers, incense, food, etc. * Practice brahmacharya – celibacy. * Worship of Tulasi Devi. The month of Kartika is the best of all months, and it is in this month that many special festivals like Dhan-Teras, Diwali, Govardhan Puja, Bhai Duj, Tulsi Vivaah and various others take place. To the supreme Lord, whose form is the embodiment of eternal existence, knowledge, and bliss, whose shark-shaped earrings are swinging to and fro, who is beautifully shining in the divine realm of Gokula, who [due to the offense of breaking the pot of yogurt that His mother was churning into butter and then stealing the butter that was kept hanging from a swing] is quickly running from the wooden grinding mortar in fear of mother Yashoda, but who has been caught from behind by her who ran after Him with greater speed-to that supreme Lord, Shri Damodara, I offer my humble obeisances. [Seeing the whipping stick in His mother’s hand,] He is crying and rubbing His eyes again and again with His two lotus hands. His eyes are filled with fear, and the necklace of pearls around His neck, which is marked with three lines like a conchshell, is shaking because of His quick breathing due to crying. To this supreme Lord, Shri Damodara, whose belly is bound not with ropes but with His mother’s pure love, I offer my humble obeisances. By such childhood pastimes as this He is drowning the inhabitants of Gokula in pools of ecstasy, and is revealing to those devotees who are absorbed in knowledge of His supreme majesty and opulence that He is only conquered by devotees whose pure love is imbued with intimacy and is free from all conceptions of awe and reverence. With great love I again offer my obeisances to Lord Damodara hundreds and hundreds of times. O Lord, although You are able to give all kinds of benedictions, I do not pray to You for the boon of impersonal liberation, nor the highest liberation of eternal life in Vaikuntha, nor any other boon [which may be obtained by executing the nine processes of bhakti]. O Lord, I simply wish that this form of Yours as Bala Gopala in Vrindavana may ever be manifest in my heart, for what is the use to me of any other boon besides this? 0 Lord, Your lotus face, which is encircled by locks of soft black hair tinged with red, is kissed again and again by mother Yashoda, and Your lips are reddish like the bimba fruit. May this beautiful vision of Your lotus face be ever manifest in my heart. Thousands and thousands of other benedictions are of no use to me. O Supreme Godhead, I offer my obeisances unto You. O Damodara! O Ananta! O Vishnu! O master! O my Lord, be pleased upon me. By showering Your glance of mercy upon me, deliver this poor ignorant fool who is immersed in an ocean of worldly sorrows, and become visible to my eyes. O Lord Damodara, just as the two sons of Kuvera-Manigriva and Nalakuvara-were delivered from the curse of Narada and made into great devotees by You in Your form as a baby tied with rope to a wooden grinding mortar, in the same way, please give to me Your own prema-bhakti. I only long for this and have no desire for any kind of liberation. O Lord Damodara, I first of all offer my obeisances to the brilliantly effulgent rope which binds Your belly. I then offer my obeisances to Your belly, which is the abode of the entire universe. I humbly bow down to Your most beloved Shrimati Radharani, and I offer all obeisances to You, the supreme Lord, who displays unlimited pastimes. Sri Damodara Lila ki Jai! 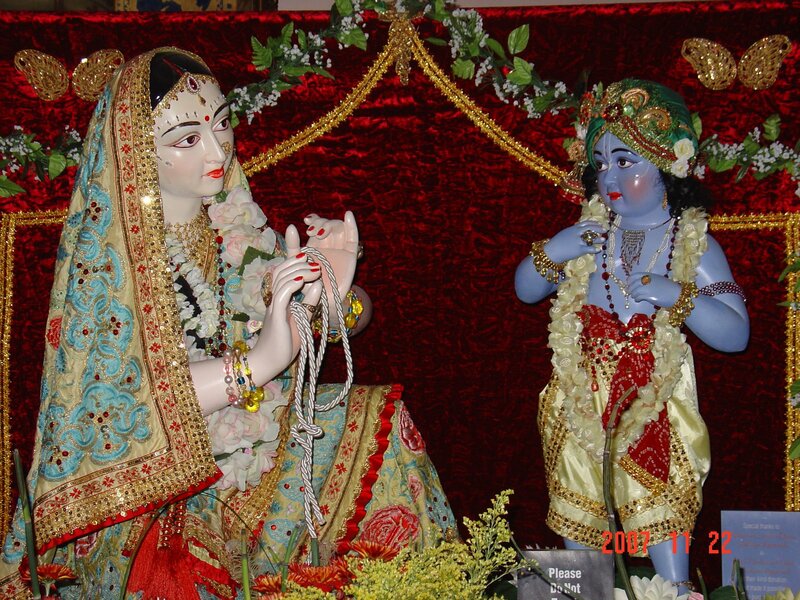 Sri Urjjesvari Srimati Radharani ki Jai!